Adding custom graphics to your canopy is a fantastic way to increase your visibility � literally! Graphics can drive sales, attract support, or simply stand out in a crowd. Given how it can impact your cause, you might think it is a complicated process to get a canopy with a custom graphic on it. But that is not the case! 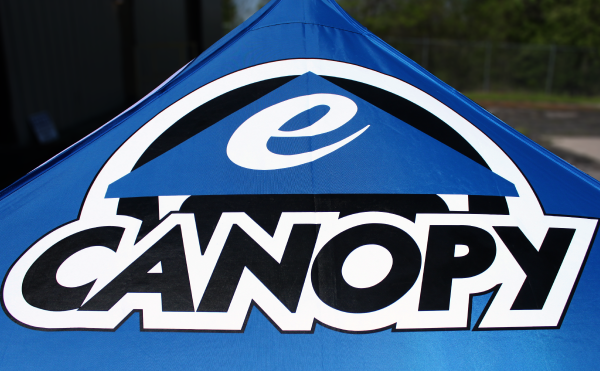 Designing a custom canopy is a straightforward process, simplified by eCanopy to make it even more painless for you. You might wonder what different canopies you can get customized. We offer different types of canopies for this. These include pop-ups, frame, and pole tents. 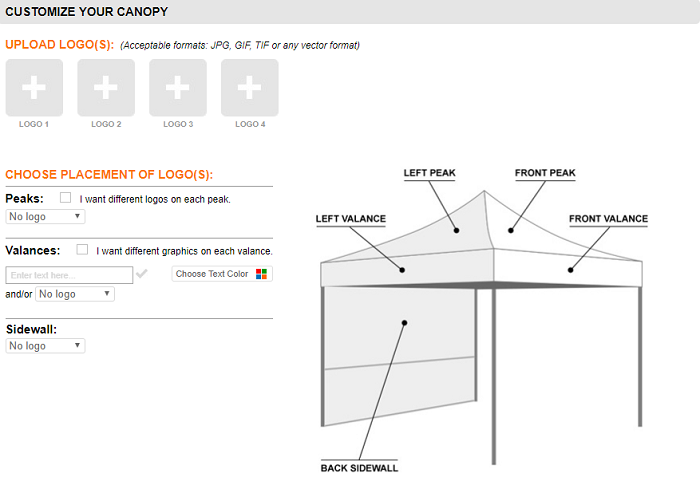 For more information about the difference between the kinds of canopies and tents, please review our Essential Guide to Canopies and Tents, which includes comparing and contrasting them. When you've decided to get a customized canopy, where do you start? 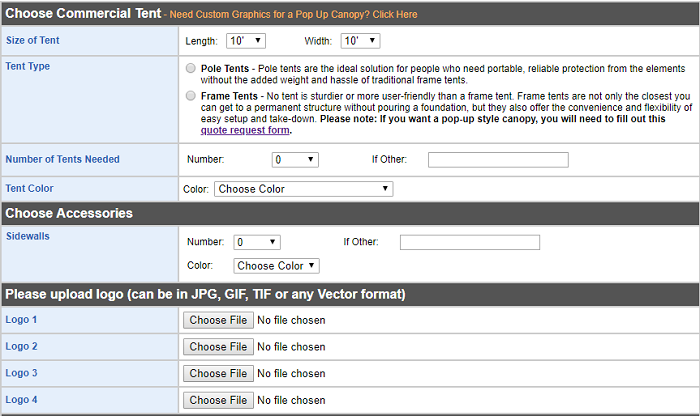 There are a few steps to follow before submitting your graphic to our Custom Graphics page. The first step will be to determine if you will need a whole canopy including the frame. Tops and frames are model specific, so if you do not already have a compatible structure, you will need to order both in order to get a custom canopy. Once you've decided on whether you need a full canopy or not, you'll go to our Custom Canopy Graphics page and begin going through the simple step by step process to receive your free quote before committing to a purchase. 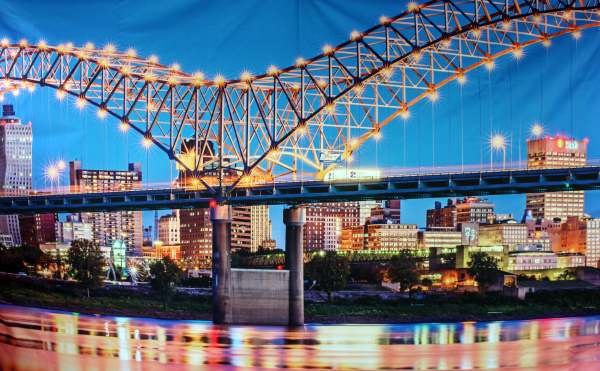 Regardless of whether you're interested in getting a customized tent for a business convention or your next family reunion, your budget plays a vital role in determining what kind of graphics package you can buy. Generally speaking, you can expect to spend anywhere from $400 to $2,000, not including the cost of the canopy and any accessories you choose to purchase. The range is so broad because the size and number of colors required for each graphic affect the production costs just as much as the total number of images you want to add. On the Custom Graphic Canopy Designer page, the first step will be to choose the size of canopy you want. There are a variety of sizes available. In the first row, you'll see a range of sizes. The main ones measure from 5 feet by 5 feet to 20 feet by 20 feet. Additionally, there are canopies available that are larger than 20 feet by 20 feet, frame tent, as well as inflatable and star-shaped tents. The process for these vary a little, so we will cover them separately a little later on. Once the size is selected, you can move on to what configuration you desire for your custom canopy. As you can see from the picture, we're going to use a 10 by 10 as our example size. 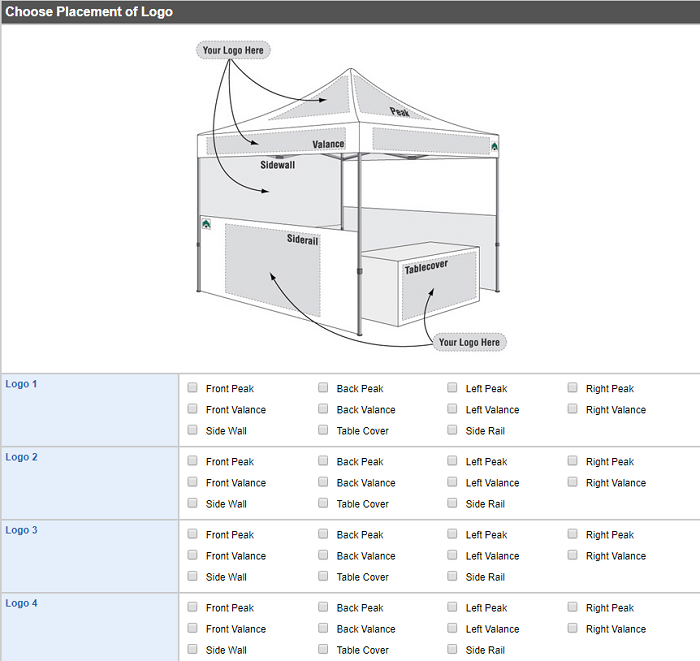 When talking about configuration with canopies, we mean the selection of which parts you want. This can be top only, top with sidewalls, side rails, or others. You can even select a custom configuration to suit your needs! So, we have our size and configuration selected. What now? Now we add a dash of color! As you can see in the picture below, we have a variety of colors from you to choose from. There's even an option to "mix it up", which allows you to make things different shades or colors. For example, if you want a black top with red sidewalls you can absolutely do so. An important note about color is that if you want a specific color, your best option is to go to Pantone's Color Finder and find the corresponding "C" PMS number, which means a solid color printed on coated paper stock. 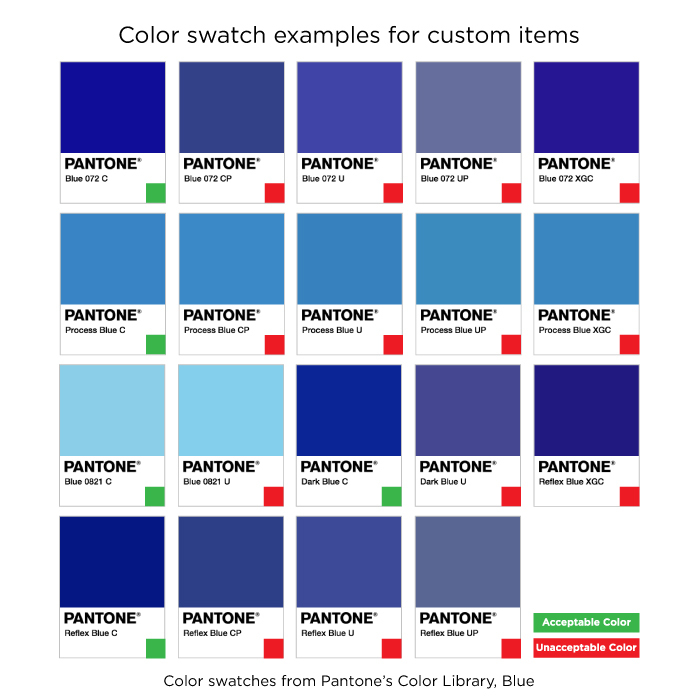 This will make things much easier and reduce the stress on everyone if you have a specific color in mind. The logo is undoubtedly the most important part of customizing the canopy, and now we're at the step where you add your logo or logos to the various parts of the canopy. With space for up to four different logos, you can make this look exactly how you'd like. This section also includes adding text to the valences if you desire. For our example, we have eCanopy on various spots while not in others. Important to note about logos is that the higher the resolution, the better. A 300 DPI file will work much better than a 125 DPI file. If you send in a lower resolution image of your logo, there may be a surcharge applied for an artistic recreation of your logo at the higher resolution. So make sure you send in as high of a resolution image as possible! The next step will be choosing your frame. Two options exist; steel or aluminum. Both have their benefits and drawbacks. The most significant differences between these two materials have to do with strength and weight. 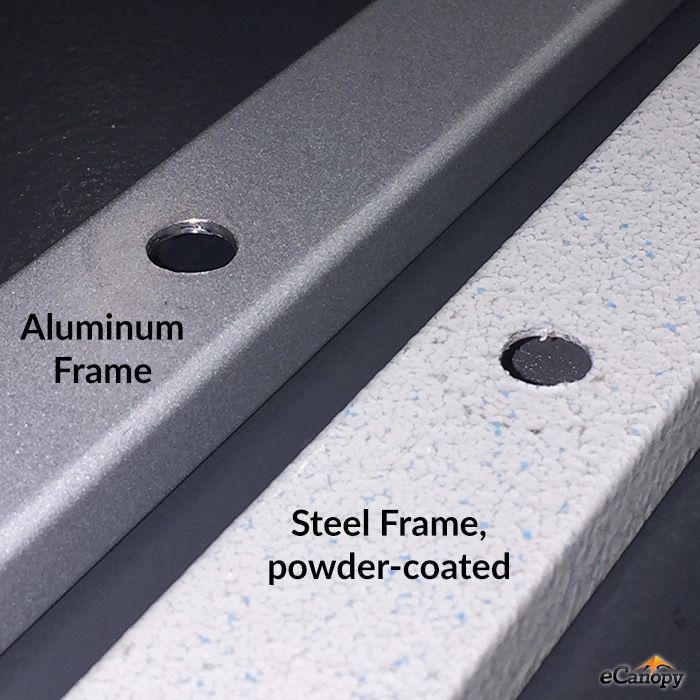 Aluminum is the lighter option but also more likely to bend than its steel counterparts. On the other hand, steel is significantly heavier, making it sturdier but less portable. Steel also rusts when it corrodes, though many steel frames do come treated to prevent rust; meanwhile, aluminum forms aluminum oxide, a hard substance that actually helps prevent further corrosion. The final step in requesting your quote is selecting the number of canopies you want, giving our graphics specialist your contact information, and including any additional information about your customization. The more detail you provide, the more our specialists will be able to assist you. After you press "request quote", we will then send your information to our custom graphics team for a complimentary rendering and quote. You should receive the quote within one Business Day of your inquiry, and a rendering can be provided within 1-2 Business Days. If you are not contacted within one Business Day of submitting your quote, please call 800-445-5611 ext 272 Monday - Friday 8:30 AM to 5:30 PM (CST) for assistance or email cgraphics@ecanopy.com. In the Designer, you may have noticed other options for canopies. This includes: canopies larger than 20 feet by 20 feet, frame tents, inflatable, and star tents. The latter two of these have a unique form, different from the designer. But first, we'll talk about the larger canopies and frame tents. The larger canopies and frame tents both still use the Designer we previously discussed. Once you select them in the top row, the configuration bar will appear. This is where you will choose the dimensions of your canopy and if you would like sidewalls as well. Once you've decided on those, the designer actually looks and functions exactly as previously discussed. Everything else is selected in the same way. Because they are different from the others, the inflatable and star tents have a different form to fill out. While this may seem intimidating, it is very similar to the designer that you previously saw, but we'll still go through and guide you on what each part means. 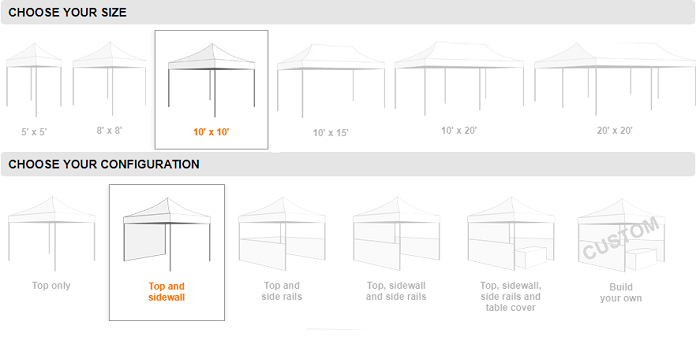 The first step in requesting these specialty tents is selecting the size you want. There is a wide range of options but don't be intimidated! It's set up that way to help you get exactly what you want. Next is the type of tent. If this confuses you, please feel free to contact our knowledgeable customer service representatives. 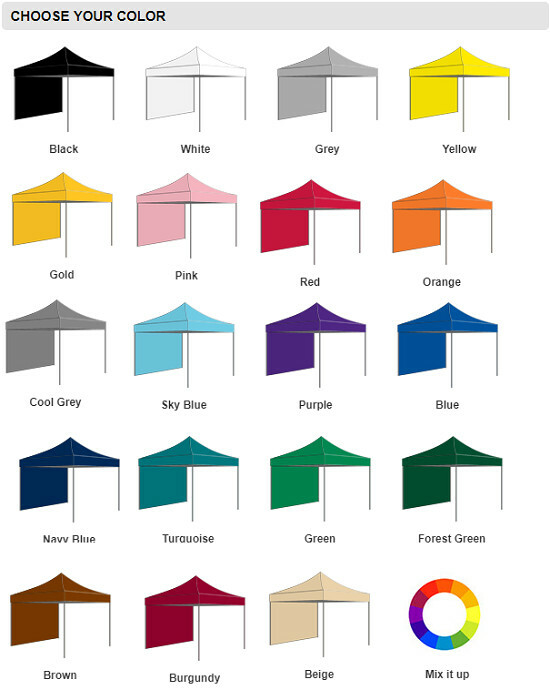 After you select your number of tents and color, you'll choose how many sidewalls and what color you want for those. Next is uploading your logos and selecting the placement. There is a diagram on the page to assist you in knowing where each part correlates. Once you've selected the boxes for where you'd like each logo, there will be a space to give additional information and contact information. 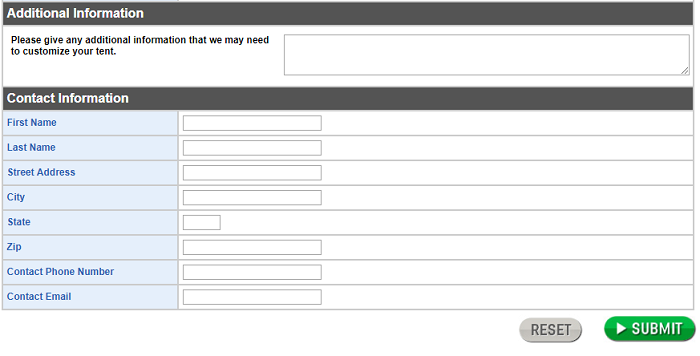 Just fill that in and then hit the green submit button! Viola, your quote for a specialty tent has been sent. Once you have requested your quote, you might be wondering what to do next. 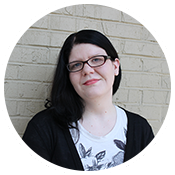 Your quote will be sent to you via email. Please note that this email will not contain the rendering of your canopy. Instead, you will need to reply to the email in order to get the rendering. After you receive your rendering and any needed changes are made, you will receive an email containing the necessary paperwork to proceed. There will be three pages to this email. First is the quote page, which will have all the quote information on it. Next are the payment information and consent forms. All three of these must be filled out in order to continue. Some customers prefer to call in their payment information, and that's fine as well. 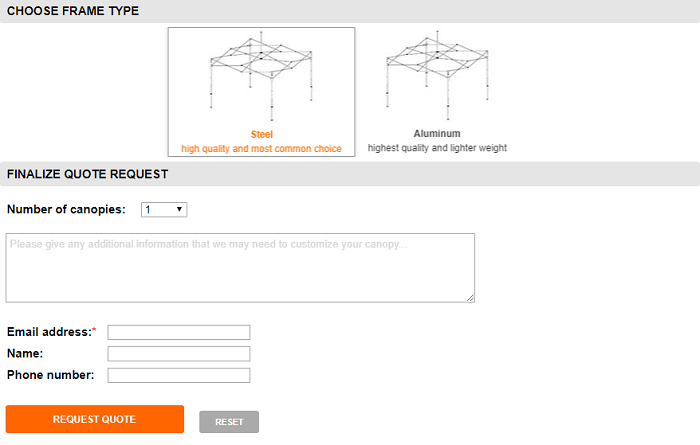 Any applicable accessories to the type of canopy you selected will also be linked for you in the email. It will also include your shipping date. Now that you've submitted all the information required to get your custom graphics on your canopy, you may wonder how long it will take to receive your canopy. As previously mentioned, your shipping date will be included in the email confirming your order. However, you can usually expect production of your custom canopy to take ten business days, though rush orders are available for six-day production. After those ten business days, it will take another two to five days to get to you. Many customers wonder what their custom canopies will look like when completed. While we know you'll be satisfied with the final product, we actually use three different types of printing to best suit your needs. The first is digital printing. 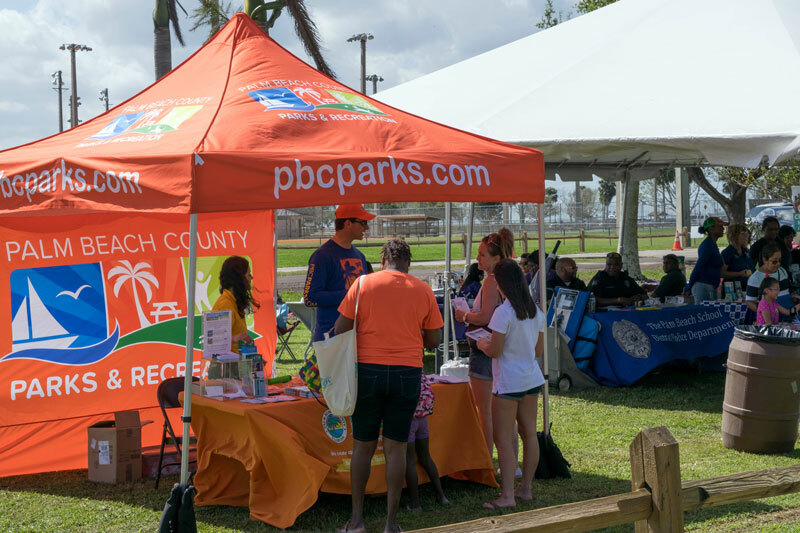 With digital printing, your canopy's fabric is fed through a large printer designed to handle the same 500-denier polyester fabric used to make standard canopy tops. This process results in an image that can handle millions of colors, your logo's gradients - or even a photo! 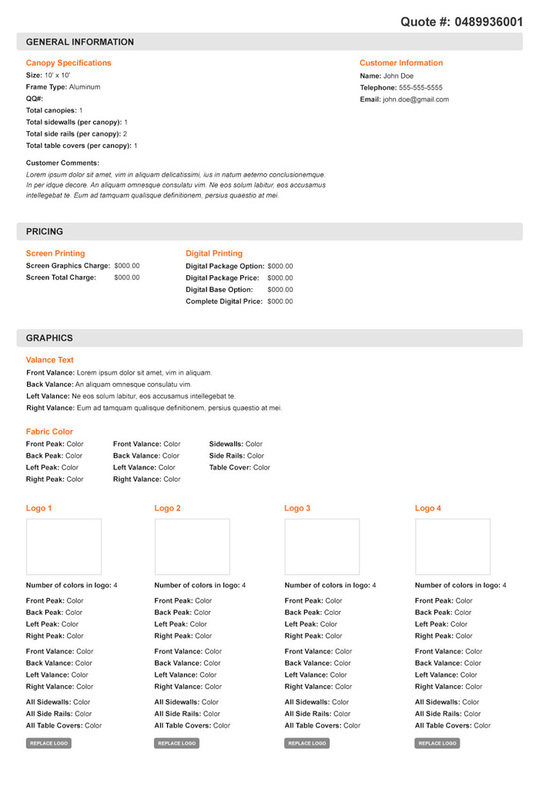 Digital printing is a good price option as well. It means there is typically a flat cost for most colors. This is also the type of printing best for if you need more than one canopy. Another option is screen printing. This is the type of printing used to print most T-shirts with decoration. Less expensive than a full digital print, these are substantially more limited with regard to color. Screen printing houses are usually limited to three or four colors - so it works much better when the logo you want printed is either simplified or straightforward. The third option is actually digital patches. Digital patches employ many of the same advantages as digital printing, but by cutting out your printed area, then stitching it to a canopy, this allows you to use a much smaller swatch of fabric, which dramatically reduces the cost. The stitching is all done with thread closely matching both the background color of your image and the canopy as well. Getting a quality canopy with custom graphics is a significant investment of time, energy, and money. However, having a custom canopy to enhance the visibility of your organization can be well worth it. So if you think you might benefit from one of a customized shelter, please contact one of the canopy specialists at eCanopy today for an obligation-free quote to getting you the exact canopy you want!